Two blog posts rolled into one today! Firstly, I was delighted to be invited to write an article for the Daily Telegraph, commenting on concert violinist Nicola Benedetti’s recent article about whether children should be made to play an instrument or not. Benedetti is a wonderful advocate for music education, and works tirelessly for the social music programme Sistema England, I nearly always agree with her hard-line (but necessary) ethos on music study, but in this case, perhaps children shouldn’t be ‘forced’ to play music or have instrumental lessons, but rather ‘motivated’ to play. See if you agree with my opinion here! 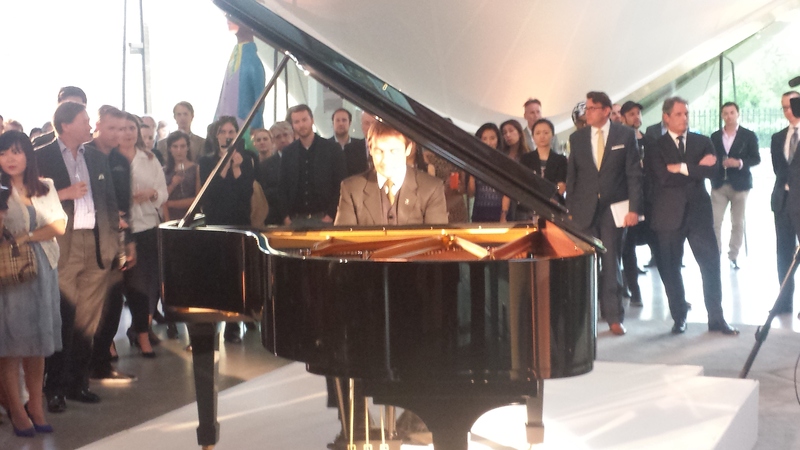 Last night, I attended an exciting landmark in the history of Steinway pianos; the unveiling of a new instrument. Held at the beautiful Serpentine Sackler Gallery in Hyde Park, London, with its breath-taking and unique modern art, providing the perfect back drop for this new venture. The first new Steinway instrument for over seventy years, the Spirio is essentially a player piano (pictured below). 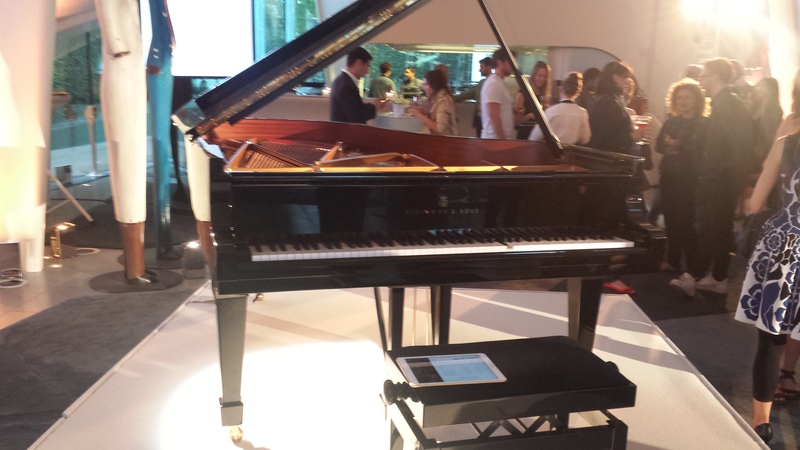 Using the finest technology, the new instrument is controlled via an iPad (provided with the piano), and it’s possible to play back performances. So whether you fancy recording yourself playing, or whether you want to hear a performance of a particular concert artist, this is sure to appeal to those who perhaps enjoy playing as a hobby and aspire to hear great players ‘performing’ on their instrument at home. Apparently, some concerts will be made available for purchasers to download and enjoy; namely those by Chinese superstar pianist Lang Lang, who will be recording his next Carnegie Hall recital using this instrument. The Spirio is available on two models; the model O and B, and last night we savoured performances on model Bs. Once the electronic device is switched off, the splendid Steinway instrument reverts to its acoustic self. 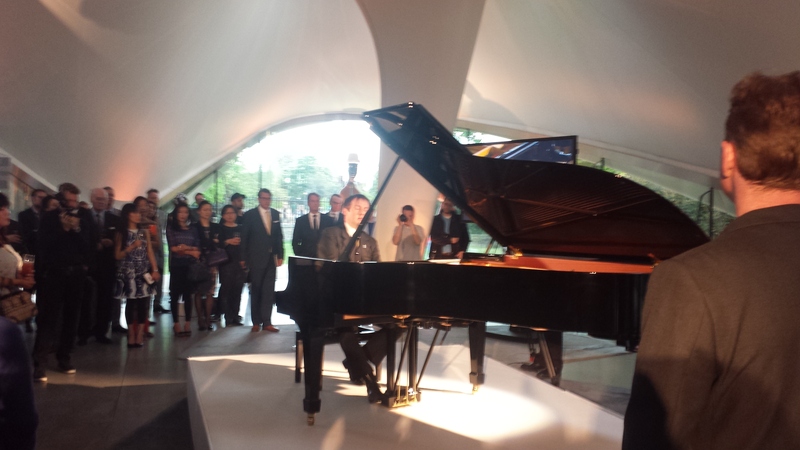 The evening kicked off (after copious, wonderfully extravagant cocktails and canapés), with a performance by British pianist Simon Mulligan (pictured playing below), who delivered two pieces; Chopin’s Grande Waltz Brillante in E flat major Op. 18, followed by a suitably jazzy, effervescent arrangement of Fly Me To The Moon by Bart Howard. After the performance took place, Simon left the stage, and we listened to a second ‘performance’ of Fly Me To The Moon, which had been recorded and was now being played back. I find piano keys moving up and down on their own a bit unsettling and even creepy (always have), but this idea, whilst not a new one, will no doubt prove popular with Steinway lovers. The final flourish appeared on the big plasma screens erected behind the piano. A film of George Gershwin playing I Got Rhythm was synchronously played with the Spirio. The great composer’s ghostly (but great) performance rang out and the piano keys danced tumultuously, receiving a rapturous applause! Another Spirio model B, was placed in a different area of the gallery, which guests could hear whilst admiring the modern art. The Spirio is certainly a beauty. I like the fact you could ostensibly record the secondo part of a piano duet and play it back, whilst playing the primo part. This device may also be useful for singers or instrumentalists who could play back piano parts during rehearsals. Hello, and thank you for sharing the news on this remarkable advancement incorporating technology with Steinway pianos. As Steinway and Sons make such a beautiful piano, I am always thrilled when I have the opportunity to sit behind one and experience part of their beautiful pieces of work. I think it’s remarkable to be able to play back performances using the iPad you mentioned in the article. This will make it possible for people to enjoy piano performances again and again!